I’ve done so many of these year “re-cap” collages from past years I couldn’t help but do another even though I’m 12 days late! My only fabric shopping over the holidays was buying a little bit of the Katie Jump Rope by Denyse Schmist re-print. It was really popular when I first started quilting, and was partly what started my obsession with fabric. I made my very first quilt with it, and so many quilts since then (like this one, and this one). Unfortunately my two favorite prints/colors weren’t re-printed (aqua basket weave and green ribbons!) but I still bought a few loved favorites to add to my stash. we have our 4th (yikes!) baby coming in May. We found out yesterday it’s a girl and I cried happy tears that Sophie will get a little sister. I was convinced it was a boy because I’ve been sick like I was with my boys…so this was a happy surprise. I started plotting matching quilts for the girls room right when I got home. I’m finally starting to feel better and less drained…and I’m excited to get back into my sewing room! Here’s to a happy and pink 2016!! 104 Responses to 2015 a little late and baby! Congrats to your baby girl and good wishes to both of you! Hooray! Here’s to a wonderful year of excitement! Woohoo I’m so excited for you! Congrats! Yaaay! Best reason ever for not sewing! We have four, too. It is the greatest. Really. A few weeks ago, we were all in the van together singing Christmas carols and you really get a nice resounding “FIVE GOOOOLDEN RIIIINGS!” with a family of six. Congratulations to you and your family! What exciting news! Where did you find the Katie Jump Rope? I have been hording my last pieces of that group! I would love to get my hands on more! I have my list of projects for 2016 made… and it seems that I have at least 3 of our patterns on the list! So, it should be a fun year! I am working on Morning Glory now. Oh, and I have Hazel fabric for another project! Yeah! I bought it from fatquartershop.com and westwoodacresfabric.com They re-printed it but it’s a little tricky to find! You might find some on Etsy too! Blessings to you and your family!! I am very happy for you. Congratulations! And 12 days late is not late at all for a mama of 4! Congratulations – this is exciting. We too have four. Wishing you all the best and glad that you are feeling better. Congrats! I love baby girls. How exciting! I’m very happy for you! Congratulations. Wishing for a year for you that is filled with happiness and pink. Congratulations! Hope you’re feeling better soon. My favourite from the Katie Jump Rope collection is the green ribbons print – and I can’t believe they’re not reprinting it! I’ve got one small piece, (5 x 2.5 inches?) left – which I’m saving for the perfect project! Me too! The green ribbons and the aqua basket weave…they were the best ones! I’ve heard that from a lot of people that are kind of disappointed in the re-print. I’ll take what I can get and I still love the greens and the aqua ribbons! Congratulations!!! I hope the rest of your pregnancy goes well!! Oh big congratulations to you and your family!! How exciting!! What a happy surprise for you! Oooh how exciting, I am so happy for you!!! CONGRATULATIONS!! I have 4 children, 2 girls and 2 boys–it is wonderful! Wow! Congratulations!! I remember when you had your lovely Sophie. So fun she will have a baby sister. Maybe another red top!! Oh I hope so! Love the little red heads! What wonderful news. Blessings to you and yours! Congratulations — all things pink to sew! Oh I haven’t been quilting much since being pregnant! Baby did not like mom sewing apparently because literally the smell of my sewing room and cutting mat made me so sick the first few months! I missed your posts, I really like them, so I am happy you’re back. Here is to more pink girly quilts! Congrats!! Exciting news! 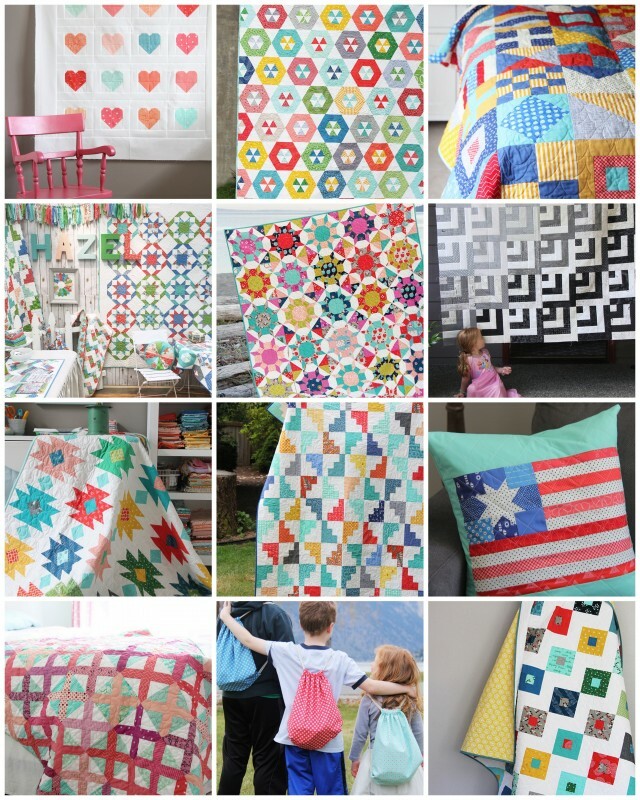 Can’t wait to see what awesome quilts you make your little one. A new little one to expect in a few months – wonderful news! What a wonderful new year present. A baby girl. congratulations and hope your morning sickness soon passes. So happy that your daughter will be getting a sister! I never had one and really miss it now that I am much, much older. My girls were so close growing up as I am sure yours will be. Congrats!! Congratulations! Can’t wait to see what you do with all the pink because I need an idea for a pink quilt this year. SO happy for you & your little girl. Sophie will have a little sister to “dress up” and play with. LOVE Katie Jump rope – I have a very small stash that I still haven’t cut in to. Congrats Amy!!! I’m so happy for you all :) Can’t wait to see the matching quilts! Also, your post reminds me that I NEED to get some of those Katie Jump Rope reprints…one of my all time favorites as well. I don’t know why I typed Amy! Of course I know your name is Allison (too early in the morning I guess)…sorry! Lol Amanda! I get called Amanda and Amy all the time! I’ll take it…both are good names too. :) Thank you!! Happiness is having a sister – congratulations to all of you! Congratulations! Hope the morning sickness passes soon. Congratulations Allison!,best pink wishes to you! Congratulations! That’s so awesome; and extra exciting for Sophie to be getting a baby sister! Yeah!! This is so exciting! Little sisters!! As a mama of 5, I found that I really enjoyed baby 4 and 5 in ways that seemed so foreign because of our experience and knowledge of the first 3 babies. Congrats! Congratulations! It’s been many years since I had my babies but you never forget that feeling of excitement. I wish you the very best in this new year. Congratulations! I love your website and I sew for my great granddaughters, Skylar, Sadie and Sophie. They are 2 1/2 yr. old triplets. I am happy your Sophie will have a sister this year. All yhe best to you and your family and thank you for all you share with us. Triplets!!! How fun and exhausting! I think my husband would have died if he saw triplets on the ultrasound! I’m very happy for you! Congratulations on having a sweet little baby girl in May. That will be do much fun. Love Denise Schmidts Katie line too. It was a hit with me then too. We are a blended family with eight children! The more the merrier! So happy for you and glad you are feeling better! I LOVE everything you do! Congratulations and May is a lovely month to welcome a new little one. Congratulations! Very happy news! Wishing you an easy pregnancy and delivery. What a happy surprise! Congratulations and I look forward to all the cute little pink things you will probably be sewing. Glad you’re ok – noticed you hadn’t posted in a bit, hope baby girl’s treating you right. Congratulations! I’m new to quilting and an avid reader from Canada. I absolutely LOVE your blog and your book :) I’ve missed your updates and seeing new projects. Hope you are feeling better these days. Congratulations!! All the best in this new, exciting year!! Having a baby is wonderful news! Congratulations! Mazel tov! All the best to you and your family. Congratulations!!! I can’t wait to see pictures of that beautiful baby in the spring!!! Congratulations! It’s going to be such a great year for you! Good for you! Two of each!! I’m happy for you and your family. You will need to take it easy! 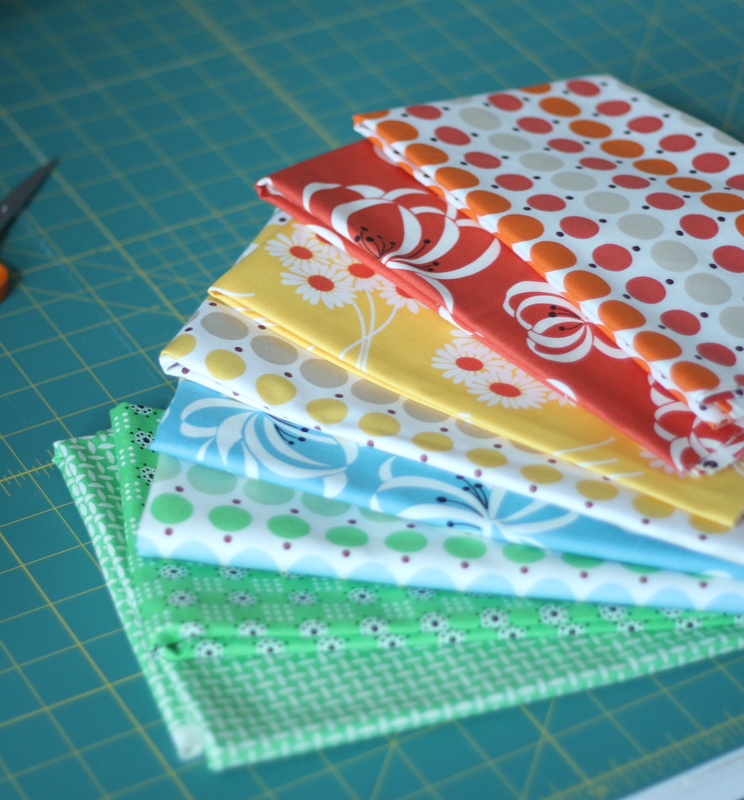 Do you have a new fabric line coming out? Blessings to you! I do Judy! I’ll show the new fabric really soon!! Congrats! Happy Dance in ballet slippers and a tiara time! Congratulations and good to hear you are starting to feel better. I’ve always heard that even numbers are easier than odds. We also have four (all girls) and it’s worked out amazing for us. They all get along and love each other. Hey, congrats!!!!! Looks like your girl will have a great best friend for life…..
Congratulations. I’m very fond of my sister, and think every girl deserves to have one! Congratulations! Enjoy the rest of your pregnancy and the nest building ☺Great opportunity to play with lovely fabrics! Congratulations on the new baby! Enjoy your little ones while they are still under your roof! Too soon, they grow up and move away! My four are all grown and gone. The one thing I regret is not spending more time with them as children! I let my career get in the way! So, love those babies and enjoy every moment with them and make no appologies! I’ve been following you for a few years and have most of your patterns and book. Thanks for being the creative quilter that you are! So happy to hear the great news..Congrats. Yippee! What a wonderful reason to be sick! I had to be hospitalized twice for dehydration on my last pregnancy. On one of those times, I was wheeled by the room of a woman in my church who was about my age. She was terminal with cancer. She was sick but at the end of her sickness there was not going to be a soft, warm lovable baby but her death. That made me so grateful for my circumstances. I’m so glad you get a happy ending after that miscarriage! Congratulations! Yay for pink fabric and girly dresses to make! Congratulations to you and your family!!! Glad you are feeling better! PINK!!! Congratulations to one of my favorite inspirations in the quilting world! Take care of yourself, and enjoy these precious days! Congratulations. 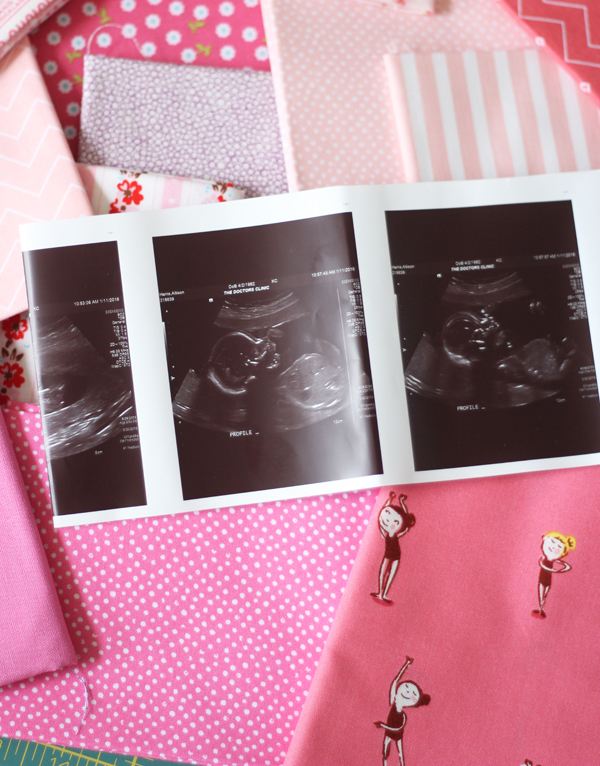 Love the little ballerina fabric, can’t wait to see what you make. How exciting!!! Congratulations!!! Glad you are feeling better! Hope 2016 is a wonderful year! Congratulations Allison on a new family member to love and cherish! Hope you get to feeling a lot better! A beautiful collage of beautiful projects – it certainly is an inspiring way to start the year! I am so excited for all of you. Another baby and a girl. I always love all of your creations and that you share with us.